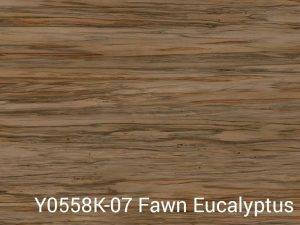 Only Table Tops and Wilsonart now offer the unique beauty of global wood species with 11 new table top designs in the “Nature Undisturbed” Collection. Capturing the beauty of threatened or endangered global design, and working harder than ever toward saving endangered and threatened non-sustainable trees. Only Table Tops is adding these new designs to its ever growing collection of available Wilsonart HPL table top surface collections for designers, architects, and furniture dealers across the U.S. Celebrating and preserving nature’s beauty, Wilsonart and Only Table Tops will now offer exotic woods through the Wilsonart High Pressure Laminate Commercial Grade Table Top Collection. 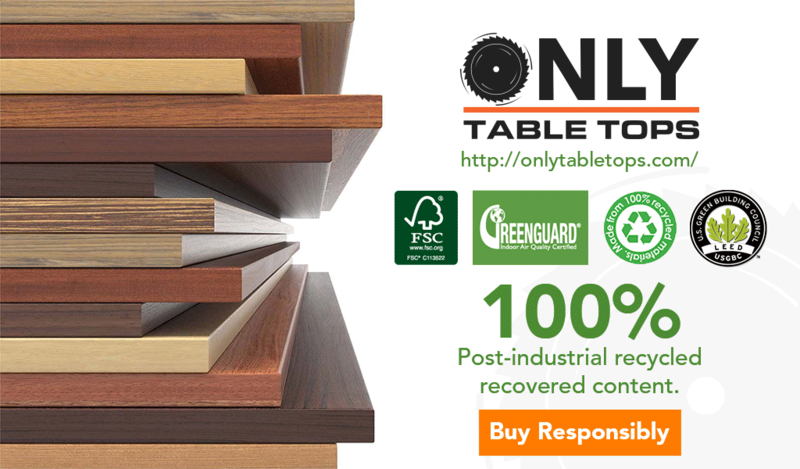 Meet The New Sustainable – 100% Recycled & Recovered Commercial Grade Particle Board Laminate Wood Table Top Designs. Now you can duplicate vulnerable and endangered wood species in our newest design collection. 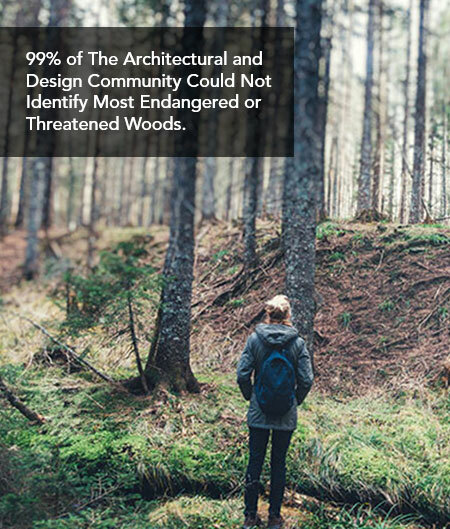 To reduce the environmental harm from designing with endangered or threatened woods. Umber Makore (Y0553K-18) duplicates an endangered wood from West Africa where overexploitation is leading to serious population declines, notably in Ghana and in Liberia, where there is a possibility of the species becoming extinct. This medium-sized straight grained wood is a mid-tone warm brown with subtle firings throughout. 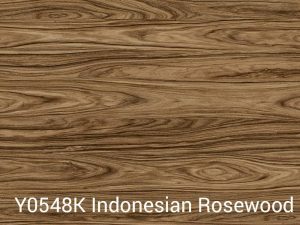 Indonesian Rosewood (Y0548K-07) is an endangered wood. Its timber is of high commercial value and wild subpopulations are widely overexploited with illegal felling, placing considerable pressure on this species. 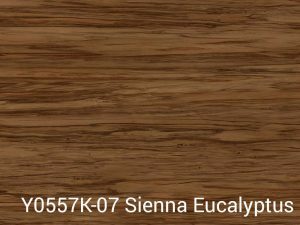 This VDL laminate design is a beautiful fawn brown exotic wood with full cathedrals in a deeper brown found throughout this stunning large-scale woodgrain. Mahogany from Central and South America is a vulnerable species and is the most commercially important of the mahoganies. Exhaustion of the species is especially hard in the northern regions of its growth. Harvesting and processing of these trees is only 50 percent efficient. 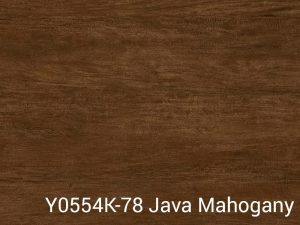 Java Mahogany (Y0554K-78) is a rich and beautiful wood design in a deep coffee / java brown, full of soft delicate graining and some firing. 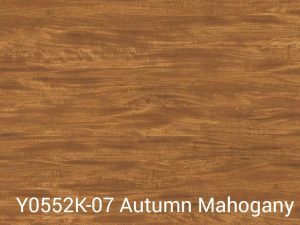 Autumn Mahogany (Y0552K-07) is a rich golden brown with subtle planking and full of firing. 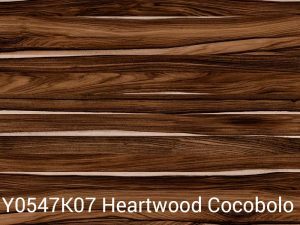 Heartwood Cocobolo (Y0547K-07) is a rich deep brown exotic wood pattern with black graining and pale sap lines that are found throughout the large-scale woodgrain. Cocobolo is a vulnerable species intensely exploited as a timber. Areas where the species was formerly widespread are almost completely exhausted, most notable in Costa Rica. The habitat has been exploited for 400 years and continuing reductions are caused through cattle ranching and fires. 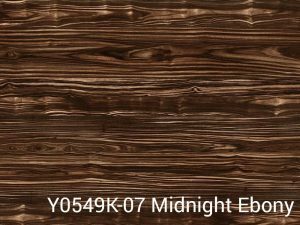 Midnight Ebony (Y0549K-07) mirrors African black wood, a near threatened wood from South Africa, which also is considered the first Ebony. Levels of exploitation are very high and larger or suitably exploitable trees are becoming increasingly scarce, causing concern over genetic erosion in many populations. The laminate is full of rich browns and ebony color with full featured unique cathedrals and bold graining. 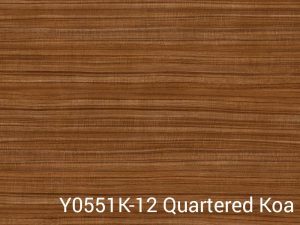 Quartered Koa (Y0551K-12) replicates the elegant straight grain wood from Hawaii. This highly desirable premium species is not considered vulnerable. However, due to land clearing and invasive species, these trees are not growing to maturity. The species is not found below 600 M elevation, but can be located only in high altitudes in remote areas of the island. 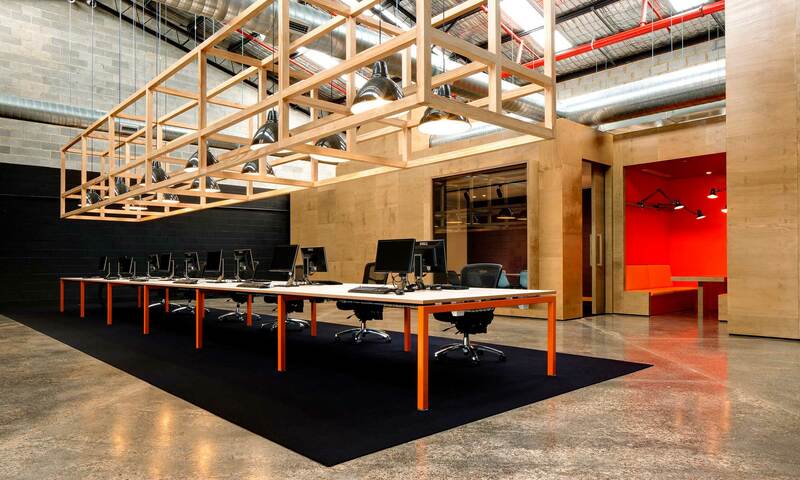 The woodgrain design is full of beautiful flaming. 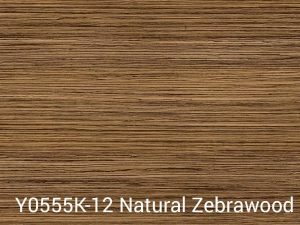 With its characteristic bold dark down wood graining found throughout, Zebrawood is a vulnerable species from West Africa. It is listed as vulnerable due to a population reduction of more than 20 percent in the past three generations caused by a decline in its natural range. 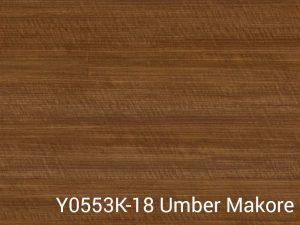 Natural Zebrawood (Y0555K-12) is a beautiful natural color with bold ebony straight graining. Exotic wood species are desired for many reasons. Primarily, these woods are highly treasured for their unique beauty, rarity, and commercial value. The demand for these precious woods is only increasing. Our response: all new sustainable engineered laminate designs from the “Nature Undisturbed” Collection which provides an alternative source to threatened and endangered woods. Architects, designers and homeowners alike are invited to explore the fascinating details of these readily—and steadily—available designs from Only Table Tops. Browse our Wilsonart Table Top Colors.